Cold, dry arctic air swept down over Canada, bringing chilling temperatures to much of the country. As the cold air moved out over the Atlantic Ocean, it met warmer, moist air and clouds formed. The clouds are thin near the coast, and thicken as the air picks up more moisture over the ocean. The ice in the clouds tint them a light orange in the false-color Moderate Resolution Imaging Spectroradiometer (MODIS) image. Since visible light is assigned to red in the false-color image, ice appears dark red and water is black. 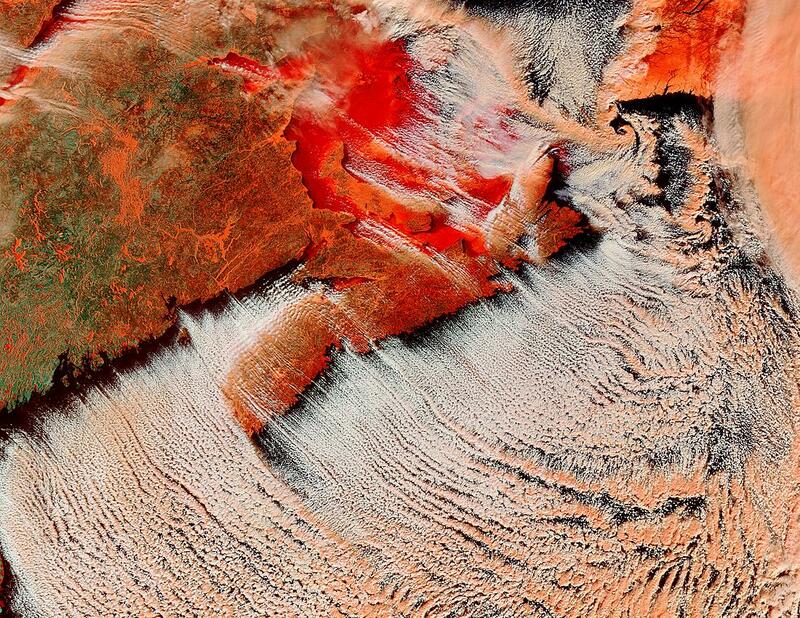 Red over the Gulf of St. Lawrence and the St. Lawrence River, upper left, attests that both are covered in a layer of ice. Ice and snow appear white in the true-color images. The ice has caused problems upstream, beyond the left corner of this image. Ice jams in the Riviere des Prairies, a tributary of the St. Lawrence River, have dammed the river, causing flooding in Montreal and Laval. The Moderate Resolution Imaging Spectroradiometer (MODIS) on the Terra satellite acquired the false and true-color image pair on January 25, 2004. A second image, taken on January 26, 2004 by the Aqua satellite, shows the same weather pattern. The white circle in the top center of the image is the Manicouagan Reservoir surrounding the Mont de Babel.